I grew up eating sambal and still have the habit of using this condiment when I eat Asian dishes (especially Indonesian dishes). It's basically, like the use ketchup in the US, Indonesians eat sambal with everything. 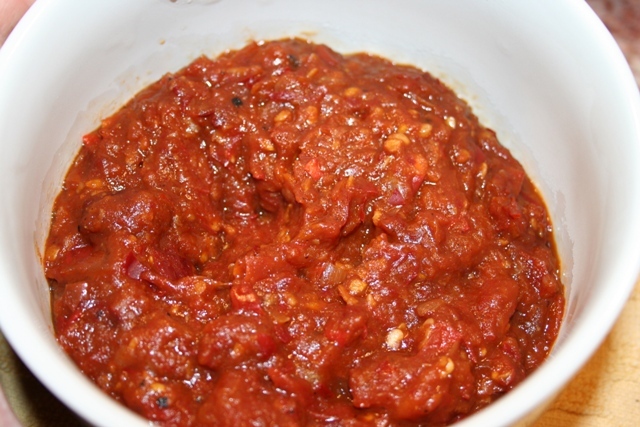 Sambal is a chili based sauce which is normally used as a condiment. 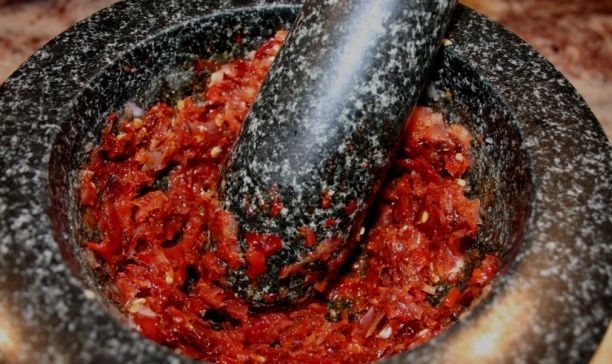 Sambals are popular in Indonesia, Malaysia, Singapore, the southern Philippines and Sri Lanka, as well as in the Netherlands and in Suriname through Javanese influence. It is typically made from a variety of chili peppers and is sometimes a substitute for fresh chilis. It can be extremely spicy for the uninitiated. Some ready-made sambals are available at exotic food markets or gourmet departments in supermarkets in many countries. The West has just incorporated sambal in their cooking. The most popular one in the US that is used in Food Network TV and by well known chefs is Sambal Oelek. Oelek means grinding or pounding. According to Wiki: Oelek is a Dutch spelling which in modern Indonesian spelling has become simply ulek; both have the same pronunciation. Ulek is Indonesian special stoneware derived from common village basalt stone kitchenware still ubiquitous in kitchens, particularly in Java. 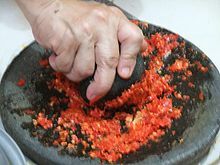 Traditionally, to make sambal, Javanese use a mortar and pestle like this one to grind or ulek the ingredients. 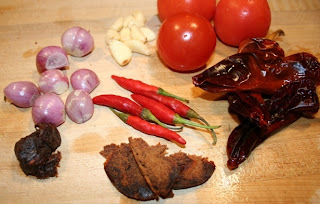 There are all kinds of sambals and this blog is only talking about one of the varieties, the vegetarian kind: sambal tomat (with tomatoes). The basic ingredients of sambals are fresh hot red or green chillies, shallots, garlic, salt, and something sour like lime, lemon, tamarind, or vinegar and something sweet may be added, too. Then, other ingredients are added to it which can be several vegetarian ingredients such as small eggplants, watercress, nuts, or fruit OR non-vegetarian ingredients such as shrimp, anchovies, or meat. For example, I blogged about Sambal 'Udang' ('Shrimp' Chili Paste) in the past (without the real shrimp, of course, but I added dulse flakes or nori flakes to create the 'seafoody' flavor). Sambal Oelek is vegetarian but this is not the most popular kind in Indonesia. 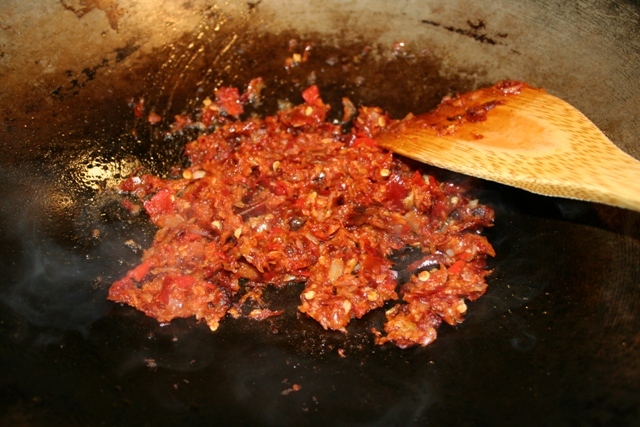 The most popular sambal in Java is Sambal Terasi or Sambal Bajak. Those contain terasi/belachan or shrimp paste. If you are a vegetarian and would like to buy a bottle of sambal in an Asian market, please check the label for shrimp paste or anchovies first. Sambal Tomat ingredients from left, clockwise: shallots, garlic cloves, tomatoes, New Mexico Chili (reconstituted), dark palm sugar, tamarind pulp, red Thai Chili (Bird's Eye chili), no shrimp paste. I love making my own sambal instead of buying a bottle from the Asian market because it tastes better home made. DH also prefers my home made sambal instead of the bottled Sambal Oelek. I also don't have to worry about reading the label to find out if the sambal is vegetarian or not. Also, to be honest, I admit that I cannot eat HOT or EXTREMELY SPICY sambal anymore. The level of heat that I can take has reduced after years living in the US. By making my own sambal, I can control how many chili I can put into the sambal. Therefore, the recipe below is not that hot. I added New Mexico or California Chili to retain the red hot color but they reduce the heat level. It looks red and hot but it is not. It is a little bit on the sweet side also because of the ripe tomatoes, New Mexico chili, and dark palm sugar. Remove the stems and seeds from the New Mexico or California chillies and then soak them in hot water. Put a bowl on top to push down the chilis (tend to float up) into the hot water so that they stay immersed. This will take about 10-15 minutes. Drain the softened chillies, but reserve the water. Soak tamarind pulp into 1/4 hot water, set aside. Put chili, shallots, garlic, and salt in a mini chopper/food processor or a mortar and pestle. If using a food processor, use the pulsing method. The texture needs to be roughly chopped instead of smooth like a paste. I like using a mortar and pestle and pound the ingredients since it produces the roughly ground texture(ulek). However, a food processor with pulsing method gives generally the same texture. If you have a mortar and pestle, you can use it. Otherwise, a food processor will do. Using a wok or frying pan, on a medium heat, stir fry the ground chili, shallots, garlic, and salt mixture with the canola oil. Keep stirring the ingredients for about 10 minutes. Be patience with this process since the long stir frying of spices is the key to delicious result. If the mixture sticks to the pan, add a little of the reserved chili soaking water (not too much that the mixture is soupy). Add the chopped tomatoes, again, stir fry for about 10 minutes until tomatoes are disintegrated. Add just a little chili soaking water if the mixture sticks to the pan. Add palm sugar/brown sugar, soften tamarind pulp (check seeds and remove) and the tamarind soaking water OR juice of 1small lime, and white pepper. Combine and stir fry 5 more minutes until the mixture is thickened. Taste for more salt if necessary. Turn off heat and add the optional white miso. 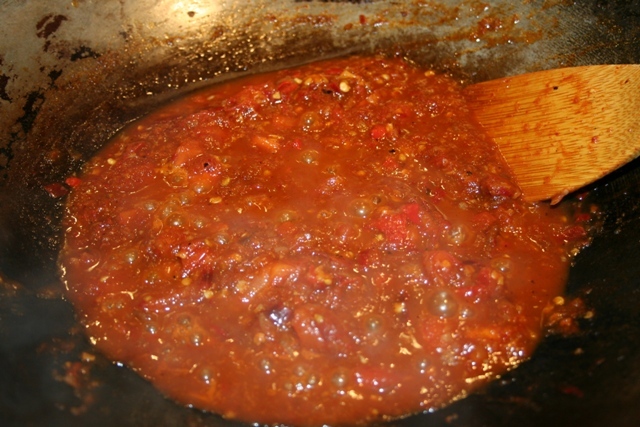 The miso adds the fermented taste to sambal. It adds more umami to the sambal, too. Combine thoroughly. 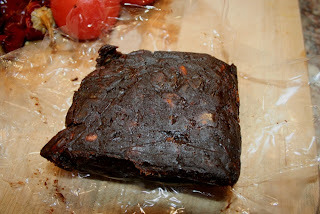 Keep refridgerated for a week in a jar. Sambal tomat is good to eat accompanying dry meals meaning a combination of fresh raw vegetables such as fresh sliced cucumbers, sliced tomatoes, raw green beans, raw cabbage wedges, lettuce pieces, etc. and steamed rice (nasi) plus some kind of fried food such as fried tempeh, fried tofu, or traditionally fried meat or fish. Eating raw vegetables with sambal and rice is called lalapan or nasi lalapan. Then, fried food is added to it. The idea is to dip the fried food or fresh veggie into the sambal and then eat it with the steamed rice. I served lalapan (with raw fresh veggies) with Nasi Gudeg as a dry meal in the previous blog. DH loves lalapan with my fresh sambal tomat. He is an American born who learned to enjoy Indonesian meals. The tamarind block I bought from Asian market. If it is wrapped in plastic tightly and store in a room temperature, it lasts many months. Every time I need it, I just cut a small chunk and soak the pulp in a hot water. Hello :-) We LOVE your image and would like to feature it in an article on our site. Please get in touch for more details - editorial.homemade@gravityroad.com. Thanks!